You can see all other posts in the right hand corner of the blog. Today we will see which colours complement each other and can be combined for attractive and elegant nail arts. 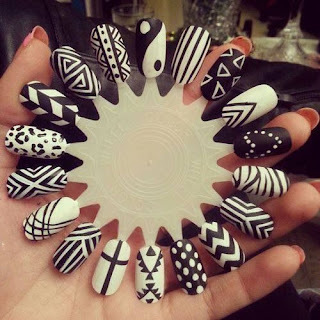 Whenever we go for a nail art all we are confused about is which colours should we go for or which colour do we want or how to use these colours and many more.. Bright colours always go together. Never use dark colours with these colours. White colour is always well put with these colours. Don't use black with them as it overcomes the colour effect created by bright colours. But black can be used as a base for these colours so as white. Use black and/or white only for bright colours. 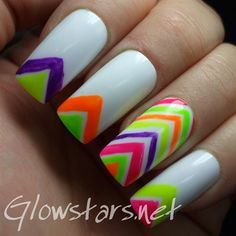 Use only bright colours for nailarts. No colour complements each other in a way as black and white. Only the use of these two colours completes your nail art. Use bright and/or white colour with black. Use bright and/or black colour with white. 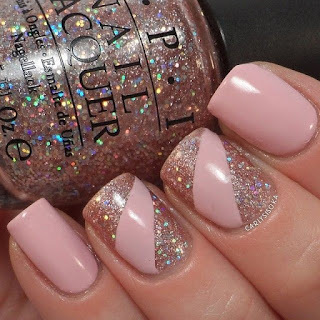 Light colours are very well used in nail arts. Using sparkle/stones on them give them a really bright effect. Black is not used frequently with them but white is. Pink looks the most elegant one. Use light colours with light colours and/or white colour. Dark colours are either are used as it is or with black. Stones and sparkles are used but not in much amount. Use dark with dark colour only. Use sparkle and/stones in limited amount.